Congratulations to our Girls JV A (5th&6th) team that had a wonderful Season! Practice for grades 1st-4th: Thursday 6-7:30pm at Radnor High School. Practice for grades 5th -8th: Tuesday and Thurs 6-7:30pm at Radnor High School. Begins late March, and runs 6-7 weeks ending the 1st weekend in June. JV Girls Lacrosse (5/6th grades): Practices 4 days/per week immediately after school. All games are after school. Varsity Girls Lacrosse (7/8th grades): Practices 4 days/per week immediately after school. All games are after school. A Saturday Tournament included. 3/4th grade Boys Baseball: All games are played Sunday's. There will likely 1-2 practices / week. This is just a fun way to get the boys to play with their classmates against other catholic schools. JV Baseball (5/6th grades): Two practices per week immediately after school and possibly a Saturday practice. All games are after school. Varsity Baseball (7/8th grades): Two practices per week immediately after school and possibly a Saturday practice. All games are after school. Varsity Softball (7/8th grades): Two practices per week immediately after school. All games are after school. St. Thomas of Villanova CYO sports are open to all Catholic children who are members of St. Thomas of Villanova Parish and are registered in the Parish PREP program or enrolled in a parish/private Catholic school. Parish children in grades 7 through high school must have had their sacraments (baptism, Eucharist and confirmation) and participate in the Parish Youth Ministry program. ​610-525-4801 if you have questions about religious education. Congratulations to all those that participated in the Region 32 track meet! Congratulations to our first place finishers: Lucy Minning (100m, 200m, 400m) Terese Trainer (800M0 & the 4X200m relay team of Lucy Minning, Terese Trainer, Nora Seasholtz,& Kelsey Wakiyama. All first places finishers advance to the Area D! 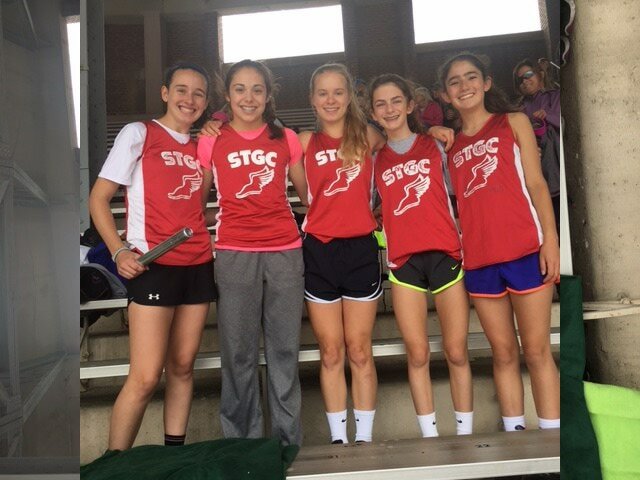 All the best to all advancing including: Lucy Henkel (200m & 400M), Molly Hass (800m & 1600m). Terese Trainer & Kelsey Wakiyama also qualified in the 1600m. ​of Good Counsel Parishes participate jointly in CYO Athletics programs offered through the Archdiocese of Philadelphia. CYO registration information can be found in the Parish Bulletin & online 1 month prior to sign-ups. Congratulations to our Region 32 Champions! Lucy Minning won the Cadet Girls 100m, 200m and 400m. Sarah Khalil won the Minor Girls 800m and 1600m. Katie Neary won the Minor Girls G Long Jump. Kelsey Wakiyama who was 2nd in the Cadet Girls 400 and 3rd in the 800. ​Molly Haas was 3rd in the CG 1600 and 5th in the CG 800. Lucy Henkel was 2nd in the MG 400 and 5th in the 200. Commerce Fisk was 5th in the NB 800 and 2nd in the NB 1600.